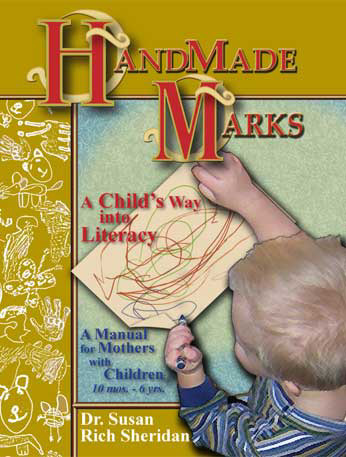 Volume II: HandMade Marks shows parents, including homeschoolers, how to develop attention, emotional connection/control, speech and literacy in children using scribbling and drawing. Exercises, developmental benchmarks, evaluation tools, and research questions included. This manual introduces a Scribbling/Drawing/Writing school-readiness program, including developmental benchmarks, evaluation tools, and lesson plans designed for parents and children from 10 months to 6 years to develop attention, emotional control and connection, expanded speech, and literacy. This scribbling and drawing program may prevent or correct deficits and delays, while adding fun and closeness to the shared adventure of literacy. Autism and technology are discussed.